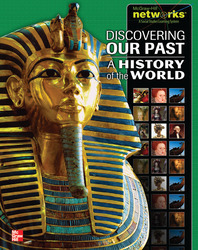 Discovering Our Past: A History of the World brings the sweep of historical events into focus as people, issues and events come to life for todays students. The program includes a strong emphasis on building vocabulary as well as tools for developing strong reading skills. The print student edition is aligned to the revised NCSS/Thematic Strands and Common Core State standards for Literacy in History/Social Studies. The program focuses on critical concepts through Big Ideals, Essential Questions and Enduring Understandings.